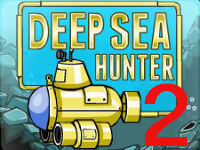 Explore the depths underwater caves to find seventh sea treasure! Control your little yellow submarine and get rid of unfriendly creatures as you try to collect precious ores. Remember to upgrade your submarine's range, speed, resistance, fire power and fuel capacity to dive deeper into the unknown!